Federal Laws that affect United States car dealers will change in 2019. Your Dealer Training Manual includes very important information about these new laws. Download your free Dealer Training Manual now. When you obtain your Auto Dealers License, you will be legally allowed to sell unlimited vehicles on Ebay, Craigslist, or your own website. Your Dealer Training Manual includes the profitable Ebay/Craiglist marketing guide. The Ebay/Craiglist contains easy step by step instructions on how to market your vehicles on Ebay or Craigslist. 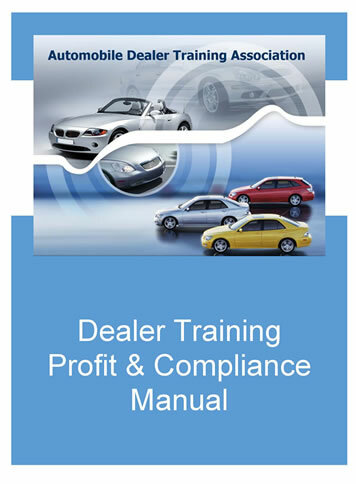 The Dealer Training Manual was written with information submitted by experienced dealership owners. You will learn the ins and outs of the day to day operation of a dealership. You will also learn how to avoid costly mistakes during the startup process and your first year in business. When you obtain your a Auto Dealer License, you will be able to enter every Auto Dealer Auction in the United States, Canada, and most of Europe. Your online dealer training manual contains excellent information on how to buy and sell vehicles at dealer only Auto Auctions. It also contains a list of every Auto Dealer Auction in the country along with sale dates. Your dealer manual author's experience will benefit you by providing an excellent, experienced overview of what to expect during your licensing process. Your dealer training manual author has extensive internet sales experience allowing him to easily explain the advantages and step by step instructions on how to sell you vehicles on the internet. Your Dealer Training Manual makes it easy to break into the world's largest vehicle marketing place. Every State in the country requires dealers to hold a Dealer Garage Insurance Policy. Your Dealer Training Manual has a long list of Dealer Insurance Providers and an excellent explanation of this complicated insurance and a list of Dealer Insurance Providers. Most State's require dealers must provide a Dealer Surety Bond or an irrevocable letter of credit. Your Dealer Training Manual will provide you with an extensive list of motor vehicle dealer bonding companies. Obtain your bond quickly and easily. A floor plan is a loan for a dealer's inventory. The Dealer Manual provides an great explanation of floor plans and direct contact information for floor plan providers across the nation. The Auto Dealers Training Association Dealer Training Manual contains several important topics relating to start up and day to day operations of your dealership. View all Dealer Training Manual Topics by clicking here. See what other dealers are saying about the Dealer Training Manual viewing Dealer Training Testimonials. When you download the Dealer Training Manual you will be able to focus on running a successful dealership, instead of worrying about how to stay compliant with Federal Laws. You can download your Dealer Training Manual by clicking here. If you have any more questions about Automobile Dealers Training Association Dealer Training Manual, please use our convenient contact form.